Roy Choi at LocoL. Photo by Audrey Ma, courtesy of LocoL. The fried chicken burg and agua fresca at LocoL. Photo by Audrey Ma, courtesy of LocoL. The Oakland LocoL team. Photo by Audrey Ma, courtesy of LocoL. Chef Daniel Patterson, co-founder of LocoL with Chef Roy Choi. Photo by Audrey Ma, courtesy of LocoL. The People's Kitchen Collective Free Breakfast Program at Life is Living at 'Lil Bobby Hutton/DeFremery Park. Photo by Sana Javeri Kadri. People's Kitchen Collective x Tunde Wey's Blackness in America at Alena Museum. Photo by Sana Javeri Kadri. Chef Khai Duong, co-founder of Asian Chefs Association. 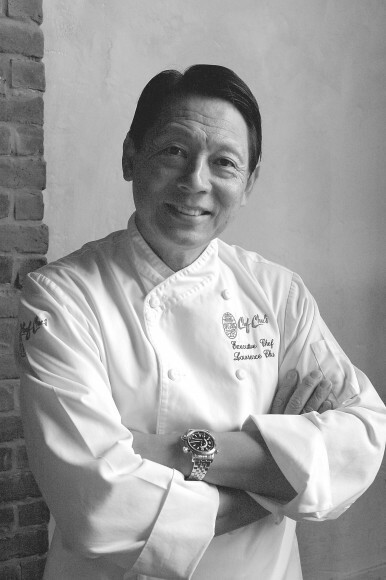 Chef Lawrence Chu, co-founder of Asian Chefs Association. Photo by Ray Grefe. Chef Chris Yeo, co-founder of Asian Chefs Association. Photo by Ray Grefe. A holiday meal served by Asian Chefs Association through Chefs Without Borders at Glide Memorial Church. Photo by Frank Jang. 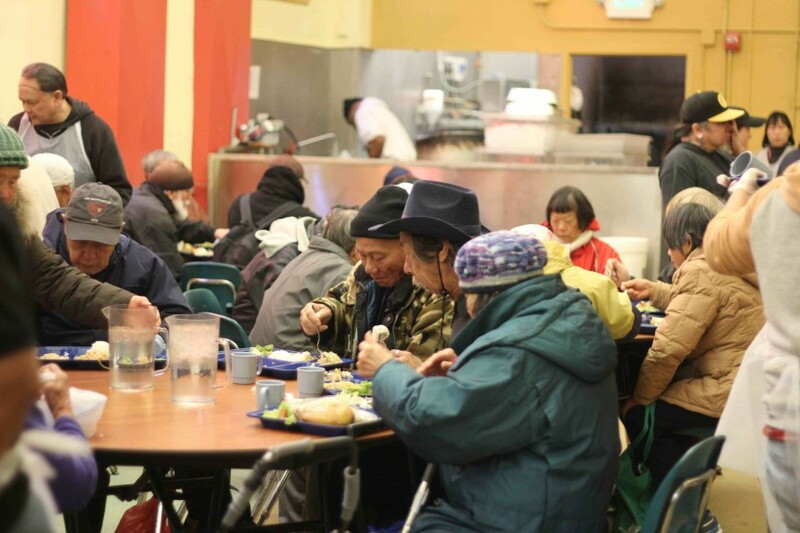 Community members gather for a holiday meal at Glide Memorial Church, served by Chefs Without Borders / Asian Chefs Association. Chefs Roy Choi, the Asian Chefs Association, and People's Kitchen Collective serve the community through food and are catalysts for change and evolution in the culinary community. In a cultural moment where chefs are revered and lauded, people who make trendsetting food hold great influence for changing our collective palates. 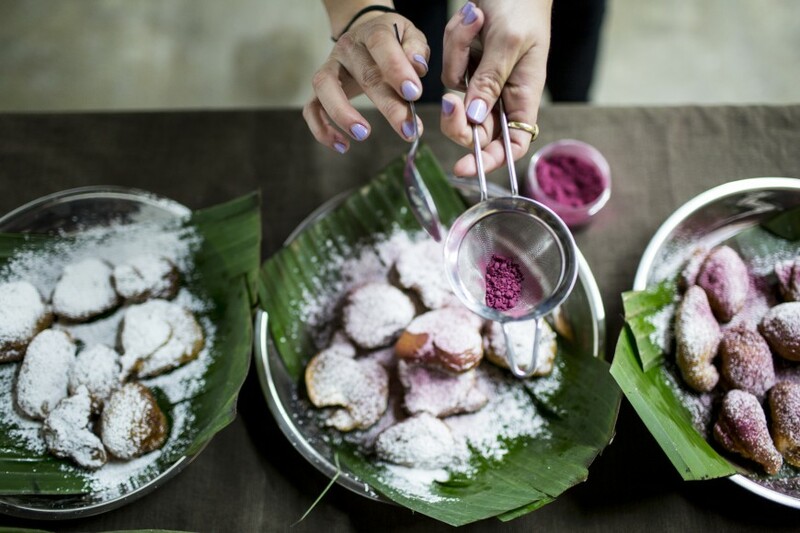 For the past four years, the Center for Asian American Media has been shining a spotlight on Asian Americans in the culinary world through the annual CAAMFeast: Food, Stories & You awards gala. This year’s CAAMFeast honorees are chefs who are uniquely compassionate in the ways they cook to ultimately serve their communities. 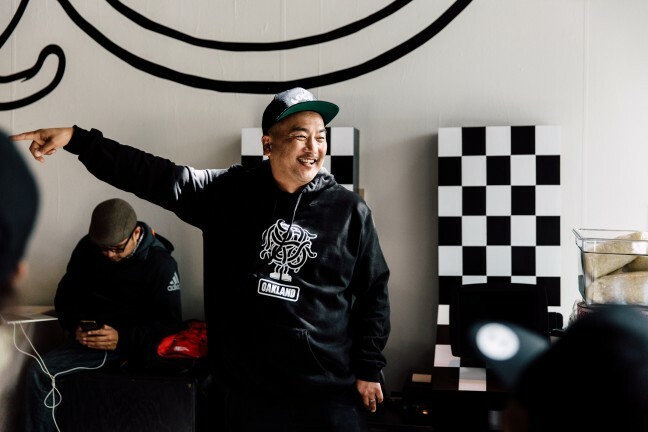 LA’s Roy Choi is upending the fast food dining model to create jobs and serve nutritionally-rich food to underserved cities through LocoL. 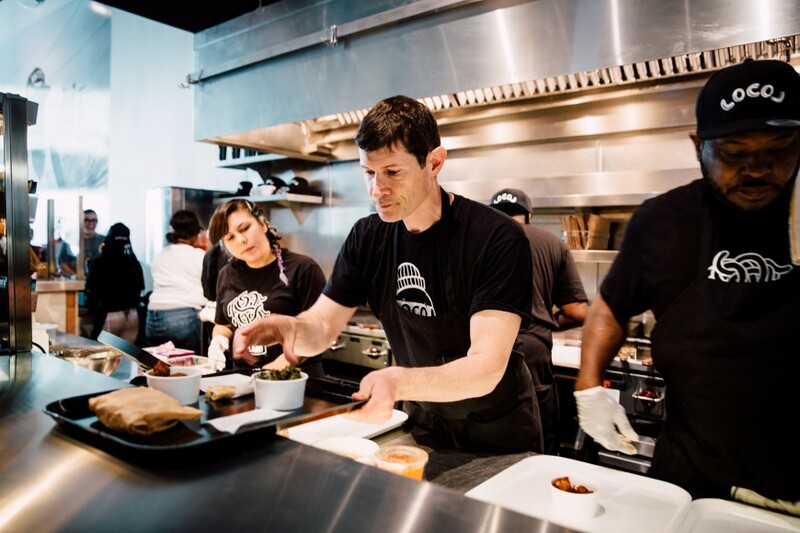 A trio of passionate chefs in the Bay Area, People’s Kitchen Collective, see food as a vital revolutionary tool to turn urban food deserts into an oasis of culinary resistance. The Asian Chefs Association elevated and pushed the boundaries of Asian cuisine in the Bay Area by valuing Asian American chefs’ achievements beyond what was in the mainstream discourse, while using their standing to halt human trafficking and give back to the community. Each chef and group of chefs are deeply passionate about people and community, using their talents in the kitchen to feed a greater good. In Watts and Oakland, Choi employs the people who actually live in the neighborhood. The Watts LocoL opened a little over a year ago, and was followed by an Oakland location. “Watts has taught us so much. People say thank you to us but it’s really the other way around,” Choi told LA Councilman Joe Buscaino during the restaurant’s opening. 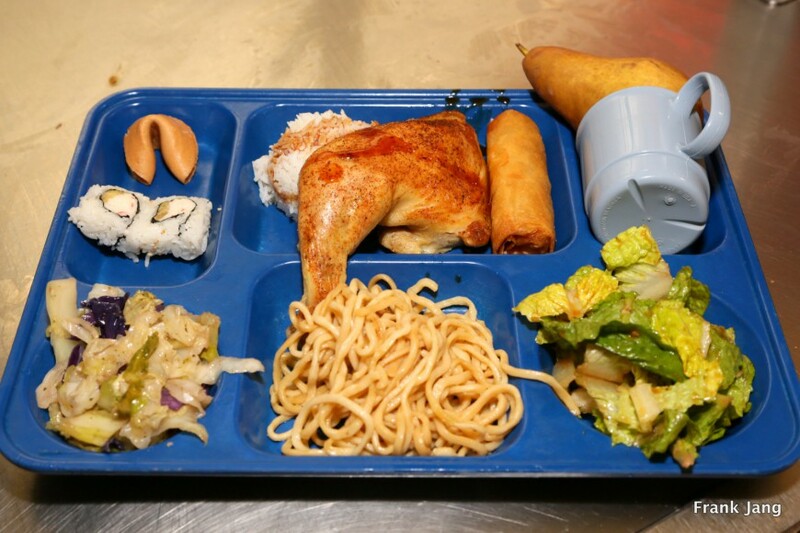 The food served is fast, minus the detrimental health effects at similar low prices. 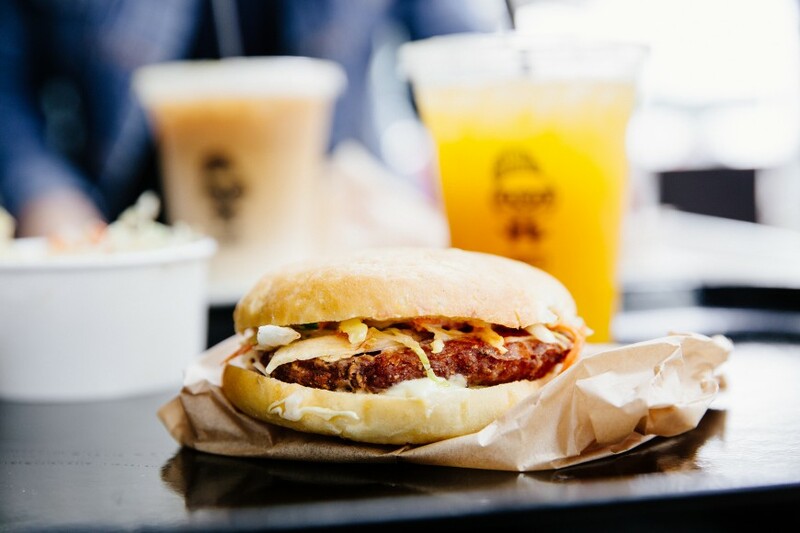 LocoL’s version of a cheeseburger, for instance, has a patty made from 30% grains and buns that are made from rice instead of wheat which is satiating without the usual greasy heaviness, harnessed between a bun created by San Francisco’s Tartine Bakery. Choi sees this project as a culmination of his cooking and entrepreneurial experience, with the necessary growing pains and exploration. “I feel like my whole life has been leading to this moment. I needed the experience, I needed the trials and tribulations and everything in life to get to this point where I could give back.” And yes, there is a LocoL truck, serving the masses in Los Angeles. The People’s Kitchen Collective Free Breakfast Program at Life is Living at ‘Lil Bobby Hutton/DeFremery Park. Photo by Sana Javeri Kadri. Working to serve the people, in a different sense, is the People’s Kitchen Collective, based out of Oakland. 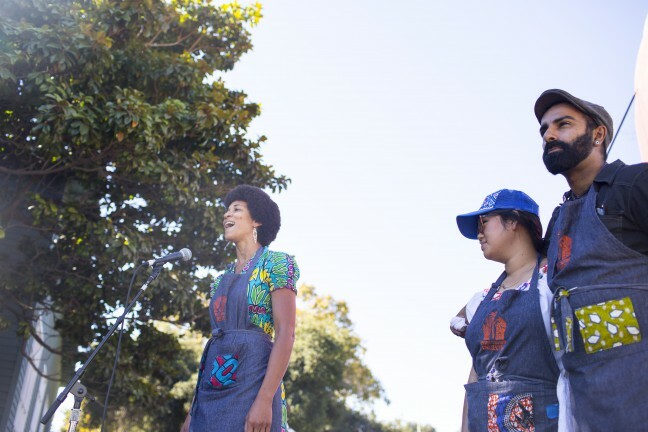 Launched in 2007 as the People’s Kitchen by activist-chef Saqib Keval and formed into a collective last year with the addition of Sita Kuratomi Bhaumik and Jocelyn Jackson, their events use food as a vehicle to dig deep into the roots of the current political climate and center the experiences of people of color. You can find them on the streets in solidarity, joining in protest at the SFO airport or marching with Black Lives Matter. “As people of color in an urban environment, our lives are shaped by displacement, migration, loss of land, and lack of access to resources,” says co-founder Bhaumik, and artist-chef. “In the absence of land, we create space through celebration and ritual in the form of a meal.” People’s Kitchen Collective produces a range of culinary events including community dinners that take payment on a sliding scale, a Free Breakfast Program in step with the legacy of the Black Panthers’ initiative to feed children each summer in West Oakland, and elaborate Diaspora Dinners for museums, universities and community centers. The mission to create new food systems is underpinned by each co-founder’s food memories that are tied to family. “Our foods are how we continue to keep culture and family alive through multiple generations of migrations,” Keval says. A cook whose migrant story lends a remarkable perspective on his success in the Bay Area is Chef Khai Duong. A graduate of Le Cordon Bleu in Paris, judge on Iron Chef Vietnam and now owner of highly sought-after Khai in San Francisco, his beginnings were modest. Raised in a family of 11 siblings in Nha Trang, Vietnam, he was aware that he had a passion and uncanny talent for cooking from a young age. “Whenever I ate something or I heard stories from older people talking about cuisine, I always memorized the whole thing,” he says. “It must be because I have passion because I love to eat.” In 1975, he fled a war-torn country to resettle in the U.S. He dropped out his final year of getting an engineering degree to enroll at Le Cordon Bleu. 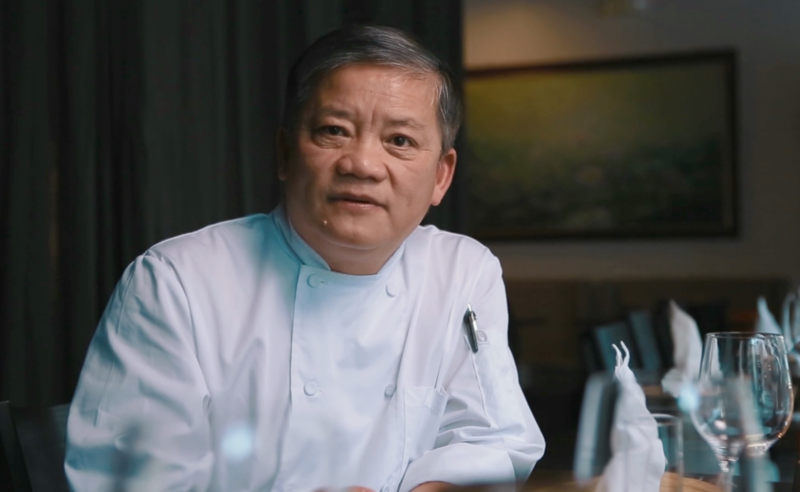 There, he learned French techniques which would become the foundation for his innovative style that blends Vietnamese ingredients with European styles of preparation and presentation. Ask him which dish or flavor best represents Vietnamese cuisine, he names durian. “When Western people hear the name, they run away. In my restaurant, I’m very proud, not because it’s a Vietnamese dish, but because it’s an ingredient people are afraid to try. But I convince them, and then they like it,” he says. Chef Khai Duong sits for an interview at Khai’s in San Francisco. Chef Khai’s pride for his homeland’s culture and flavors translated into collaborative work with chefs whose passions dovetailed. 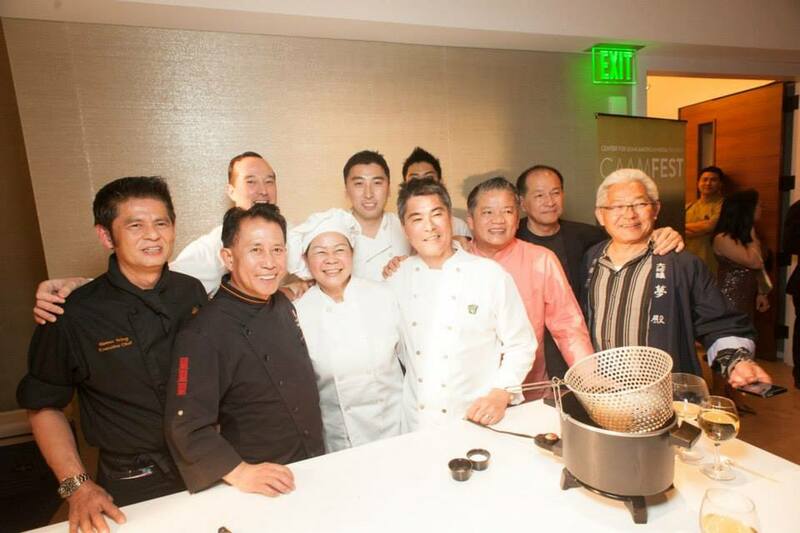 Together with Lawrence Chu (Chef Chu’s) and Chris Yeo (Straits; Sino), they launched the Asian Chefs Association to promote the work of the Asian American culinary scene. “People forget about Asian chefs. They are very talented, too. We started this to make noise around the Bay Area,” says Duong says. Chu is known as the charismatic owner of his Los Altos Chinese food institution, which has fed many of the great tech moguls. Yeo, who started off as a hairstylist, channeled the eclectic flavors of his home in Singapore and was the first restaurateur to open a place that served Singaporean cuisine in 1987. Straits Cafe was so successful that it prompted the opening of Straits Restaurant and Sino Restaurant & Lounge with locations all over the Bay Area. While each chef’s cuisine and style differs, the heart of their work is a commitment to people. And that is something that truly feeds the soul. Diana Tsuchida is a freelance writer and digital strategist living in San Francisco. She is the author of Table for Eight: Asian American Women Chefs You Should Know and A Conscious Verse in Diversity: Exclusive Chat with “Master of None” Co-Creator Alan Yang. She is the creator of Tessaku, an oral history project that shares stories from Japanese Americans who experienced the internment. CAAMFeast Awards: Stories, Food & You is an annual cocktail gathering and culinary awards ceremony benefiting the Center for Asian American Media. Launched in 2013, CAAMFeast pays tribute to the stories behind today’s Asian American culinary luminaries and highlights their undeniable contributions to our ever-expanding culinary landscape. This one-of-a-kind evening features delectable tastings from award-winning restaurants and a moving, multi-media tribute to the year’s honorees. Attendees rub elbows with icons and game changers of the food world and participate in an exciting live auction, featuring exclusive tours, travel packages and coveted dining experiences at the Bay Area’s hottest restaurants. Our 2017 honorees draw upon the deep history of food activism in the Bay Area, reimagining not only what we eat but also bringing to light the complex rituals, history and barriers that comprise our diverse cultural practices and current food system. 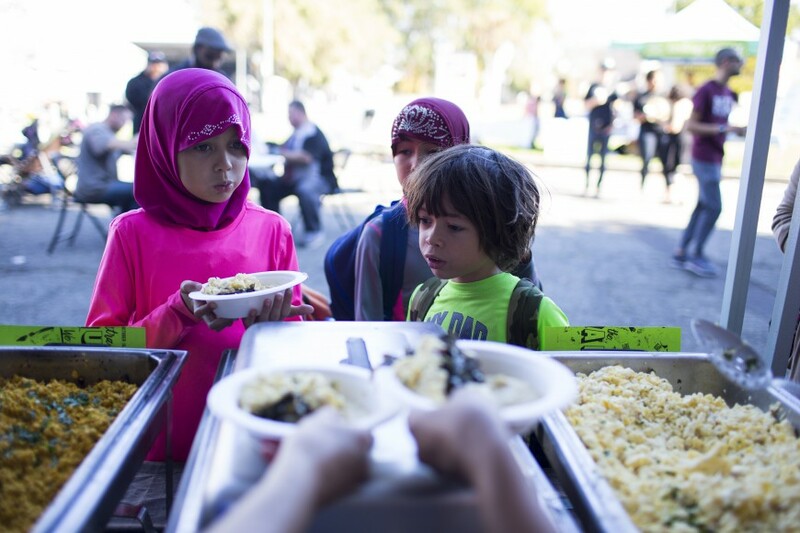 Through community meals and workforce development, their work lifts up the Asian American community and beyond, providing pathways toward more just and equitable foodways. 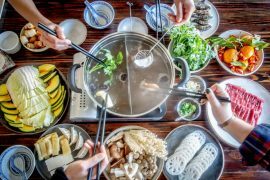 Join the Center for Asian American Media as we honor the culinary personalities who are rewriting the conversation around Asian American food. Regular Tickets: $200 general, $300 VIP, $100 Student and Non Profit. View exciting photos and honoree bios from last year’s event. For table and auction sponsorship opportunities, please contact Sierra Lee / slee@caamedia.org / (415) 863-0814 x123.